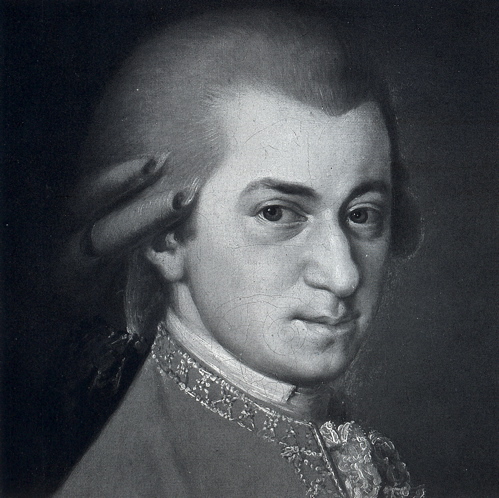 Mozart had composed numerous Serenades. This particular one K. 522 in F major was funny and interesting. Mozart was writing this Serenade in F major for the audiences of the late 18th century. However, what they found amusing may need some explaining to the 20th century ears. Some of the jokes are obvious whereas others are subtle and can be obvious to the trained musicians. In the first movement Allegro, our village composer calls the orchestra together with three unison chords. But soon very disappointing is the composer seems running out of ideas. The rest of the movement just revolves around these three chords. Now and then there are meaningless triplets, viola trios and ending where the French horns are late by a bar to the rest of the orchestra. Second movement is to be played majestically as if a dance music for a grand occasion. Everything goes on well, until a passage where the poor French Horns go out of tune and make a frightful mess of things. After that again the composer runs out of new ideas and you will just get strings wondering with ascending and descending scales. Finally all have to be repeated but our dear horns create the same mess. In the third movement, our village composer finally surprised the audience by giving us a very beautiful and lyrical Adagio Cantabile. Without much surprise, the orchestra managed to bring the movement to the ending, where there would be a violin candaza. As usual the solo violin would like to show off his technique by starting quietly, getting faster, indulging in a few double-stops and running notes. Sure enough our deal violinist accomplished all of these, but only in the end he went out of tune at the high notes, and one of his string snapped at the most critical moment! Leaving with 3 strings, the red-faced soloist and the orchestra just had to draw a curtain over the disastrous episode. The last movement was a happy and joyful Presto. Things again started off smoothly, although the strings seemed to have some difficulty keeping to the key. Then the dear composer was trying to execute a fugue, only to end up a lame, square and jerky musical phrase that was played one followed by another instrument. After that the French Horns executed a very long trill that had not much meaning. You know for a French horn to execute a long duration trill is quite a tedious task, not to mention French horns at Mozart’s time! After that, again our composer ran out of ideas and the movement ran again into running notes and scales and meaningless notes. Finally the horns covered themselves with glory with a well-performed passage, but only to lead the music to the end with 3 cords that were not in harmony! Listeners without much musical background may not be able to fully catch the jokes in this serenade. But those with some knowledge in music composition will definitely have a good laugh while listening to the movements. I first listened to ‘The Musical Joke’ back in schooling days. There were these values for money ‘The Great Composers’ series of cassette/LP with book that were available at the bookstores. 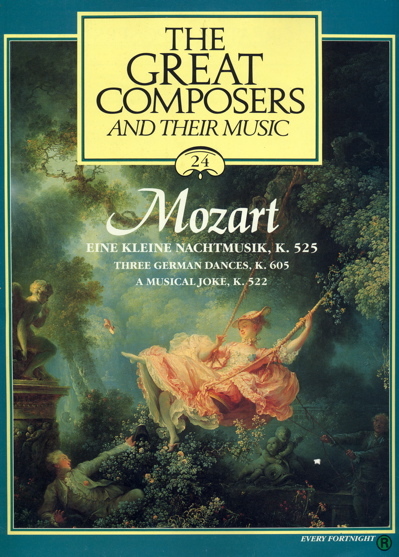 These series covered a very good selection of classical music from Baroque to modern era, and many important opera works. With every music selected there was a book with detailed description of the music and some historical background, and you got a choice of either cassette or LP with a performance of that music. The first releases of ‘The Great Composer’ were really good as the performance was recorded by reputable conductor and orchestra. The second release, now with CD instead of the choice of cassette/LP, the same work was performed by mostly Eastern bloc orchestra. While these orchestra still give a fair performance, I missed the sparks you will get from the more reputable ones. This recording of ‘The Musical Jokes’ by Academy of St. Martin-in-the-Fields chamber ensemble I believe is not common in the market, as ‘The Musical Joke’is unlikely a popular repertoire. Also recorded in this CD are ‘Eine Kleine Nachtmusik’ and ‘Divertimento in D’. 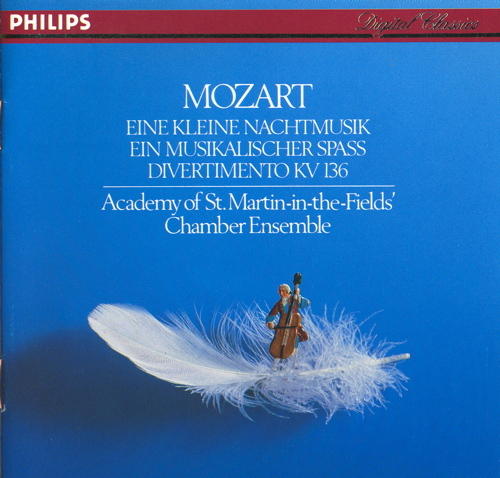 Different from many other recordings of Mozart Serenades, these recordings used small ensemble and few instruments, like one first violin, one second violin, one viola, one cello and one double bass. Instrumentation is lean. In ‘The Musical Joke’ we have two violins, one viola, one double bass and two horns. The musical effect is quite different when these pieces are performed by small ensemble and larger scale orchestra. A lean instrumentation sounds more lively, and the sound is clean as every part there is only 1 or 2 instruments. Especially for violins you get to hear very clearly the trios and ornaments.